In a literacy-rich classroom, students have a variety of reading experiences throughout the day. They hear written texts read aloud through interactive read-aloud, they participate with their classmates in shared reading, and they experience tailored instruction in small guided reading groups. But it is through the reading minilesson that you build on those experiences by making one important understanding visible. Students are then responsible for applying that understanding consistently in their reading, which will allow them to reach their ultimate goal: joyful, independent, and meaningful processing of a written text. A reading minilesson takes only a few minutes per day and usually involves the whole class. Each minilesson engages your students in an inquiry process that leads to the discovery and understanding of a general principle. It builds on a shared literacy experience (e.g., interactive read-aloud, shared reading, book clubs, guided reading) that the children have participated in prior to the lesson. The reading minilesson serves as a link between that prior literacy experience and their ability to apply this experience to their own independent reading. Making these explicit links is the goal of minilessons. All teaching, support, and confirmation lead to a student’s successful, independent reading. How Do Fountas & Pinnell Reading Minilessons Work? Management: Teach routines that are essential to the smooth functioning of the classroom and other instructional contexts. Literary Analysis: Build students’ awareness of the characteristics of various genres and the elements of fiction and nonfiction texts. Strategies and Skills: Reinforce broad principles that every reader in the class needs to learn. Writing About Reading: Introduce and help students’ use a reader’s notebook to respond to what they read and promote independent literacy learning. An umbrella is a group of related minilessons. Presenting several lessons within one umbrella helps children develop a deeper understanding of concepts and their application. As lessons build on each other, teachers will make a visual representation of the principles (e.g., anchor chart) that can be referenced again and again as students encounter new texts. Minilessons are most powerful when taught in response to an observed authentic need. Click here to view a sample minilesson. Through minilessons you will be able to foster a classroom community through the development of shared language. You will be able to create relevance by linking to previous learning experiences and reinforce effective processing systems. 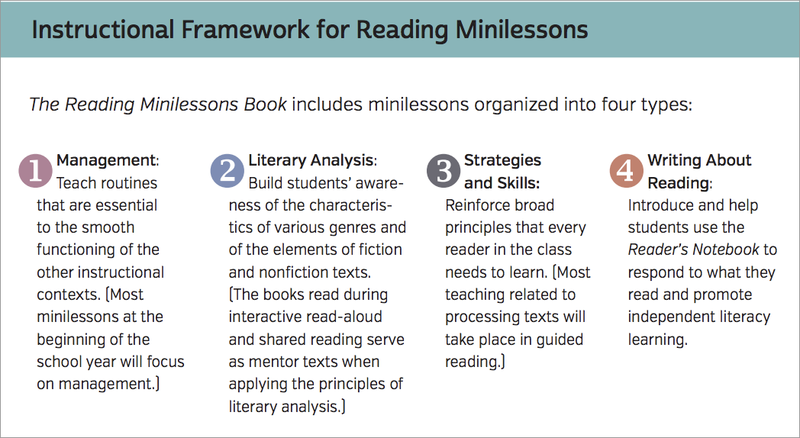 Reading minilessons can be a powerful tool in developing students’ deep knowledge of literacy concepts, which will lead to the enjoyment of the written text every day. This is what it means to grow up literate in our schools.